As effort to let users to learn more about how Internet Explorer 9 unlocks the Beauty of the Web, the software giant, Microsoft has released “Internet Explorer 9 Product Guide” digital e-book in PDF and XPS formats. This digital e-book has been designed to provide details of the new features in Internet Explorer 9, highlights key features and provides additional information on features specific for end users, developers and IT professionals. Introduction – Introducing Internet Explorer 9, performance Improvements, site-ready HTML5 and site-centric design. Internet Explorer 9 Product Guide for Consumers – All-around fast, clean with a focus on your websites and the browser people can trust. 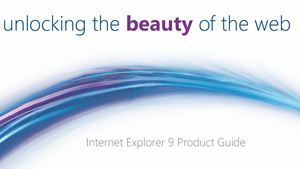 Internet Explorer 9 Product Guide for Developers – All-around fast, clean with a focus on your websites and interoperable with same Markup. Internet Explorer 9 Product Guide for IT Professionals – All-around fast, clean with a focus on your websites and the browser people can trust.